Remember those adorable, little plastic baseball helmets you'd get filled with a reasonably sized sundae via the kids menu during your carefree youth? Well, the Chicago White Sox just put the, ahem, Big Hurt on your childhood memories. They're upping the ante on insane ballpark foods by unveiling a supremely gluttonous, 12-scoop banana split sundae that will come in a full-size batting helmet, complete with four scoops each of vanilla, chocolate, and strawberry ice cream. 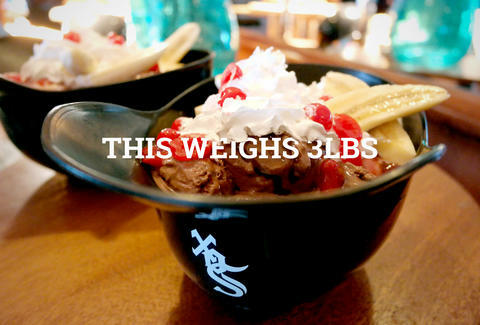 The 3lb, $17 ballpark monster treat will then get drizzled with caramel, strawberry sauce, and chocolate syrup, and finally, get topped off with two bananas, whipped cream, and cherries. Sure, the Sox say it's meant for sharing, but you know you want to try and take it down solo. They clearly want you to, as well -- they've indicated some special plans for the first intrepid eater to take down the whole thing. Thrillist could not confirm at press time whether or not said plans involve a defibrillator. Julie Cerick is an Editorial Assistant at Thrillist, and is known for being easily won over by nothing more than a heaping basket of French fries. Follow her on Twitter.